Even though this came from a Moonie publication, I have decided to leave it up because I think that Bill Clinton as Secretary-General would be a great idea. Update: I have been reminded by some friends that UPI, a once respectable press outlet is now a Moonie publication. So that makes this article much less credible, and I will soon remove it. Nonetheless, if possible, a Clinton UN Secretary Generalship would be great, I think. WASHINGTON, Oct. 20 (UPI) -- Former U.S. President Bill Clinton has set his sights on becoming U.N. secretary-general. A Clinton insider and a senior U.N. source have told United Press International the 56-year-old former president would like to be named leader of the world body when Kofi Annan's term ends early in 2006. "He definitely wants to do it," the Clinton insider said this week. A Clinton candidacy is likely to receive overwhelming support from U.N. member states, particularly the Third World. Diplomats in Washington say Clinton would galvanize the United Nations and give an enormous boost to its prestige. But the former president's hopes hang on a crucial question that will not be addressed until after the presidential elections: can he get the support of the U.S. government -- a prerequisite for nomination? The political wisdom is that a second George W. Bush presidency would cut him off at the pass. The notion of Clinton looming large in the international arena from "the glass tower" in New York would be intolerable to the Bush White House. If Democratic candidate, Sen. John Kerry, D-Mass., wins on Nov. 2 the prospect of Clinton as secretary-general won't exactly be welcome either, but Kerry would find it much harder -- if not impossible -- to go against it. Wow, this is exciting! Imagine, what more effective way could there be to mend the alliances that George W. Bush has so badly damaged around than world than to to have Bill Clinton as Secretary General of the UN? Clinton brought great international respect and credibility to the United States, and as Secretary General, he could bring it back, as well as bring credibility and strenght to the United Nations and international law. The prospect of Clinton as Secretary General wouldn't be welcome in a Kerry administration? Say what? I don't think any other single thing could strengthen President Kerry's hand more when it comes to rebuilding international alliances, and extracting us from the mess in Iraq. Kerry's bringing Clinton out to campaign with him in a few days is likely a sign that in a Kerry administration, Clinton will play an important role, and this could be part of it. Yes Yes yes!! I've been saying this for so long. Bill Clinton would be SOOO right as Sec. Gen of the UN. As much as he's loved by the rest of the world, and hated by the freepers, and with his ability to get things done and love for policy wonkdom, he would restore so much credibility to the UN and probably make it more effective than it's ever been in its history. God, I hope there is some truth to this. 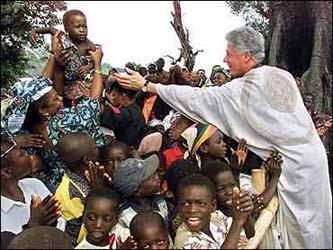 Bill Clinton for president of the world! I heard from other sources that Clinton wants this too - he needs a new calling now he's no longer in the limelight. However, the non-partisan word on the street among British media and respected politicians is that there is absolutely no appetite for an American in the top UN job. No offence, I think Bill could do some good, and maybe these commentators are mistaken, but the consensus is that Democrat or not, being American would be a huge handicap in the current climate. Don't forget, America (as a political entity, not Americans themselves) is deeply unpopular in the world at the moment. It'll take some healing.